﻿Bruce Goodman's "Why people hate taxes"
1. Food is not a taxable item. If however you have eaten a cherry in the last financial year, then roughly 45% of the cherry is non-edible, being the cherry stone and stem. 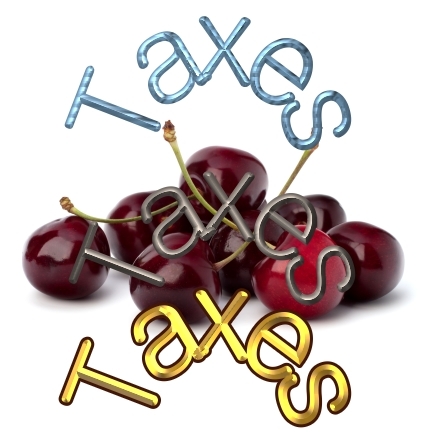 The tax element for each cherry purchased is 22% of the total cost of each cherry divided by 45%. Multiply this by the total number of cherries devoured. If however, cherries were purchased for the hospitality industry, go to question 275 on page 84. If the cherries were purchased and allowed to go rotten before being devoured, add 7.5% for wastage tax, bearing in mind that if they were removed from your premises inside an official town collection trash bag, then 0.5% can be deducted from the 7.5%. Attach the receipt for the trash bag when sending in your tax return. If the cherries were imported from overseas, the tax rate is 47.2% per cherry, unless they were Romanian-grown, in which case the stones are inclined to be larger and the tax rate per cherry is 48.6%. If you haven’t eaten any cherries in the last 12 months, then go to the Health Section beginning on page 2,439 and explain why you’re not eating healthily. Note that a cherry on top of an ice cream sundae is regarded as part of the ice cream sundae and is taxed under the dairy section of this tax return.